After another season of play testing was clear that missions had to be worked and tuned a little, so I made some minor changes in the missions. 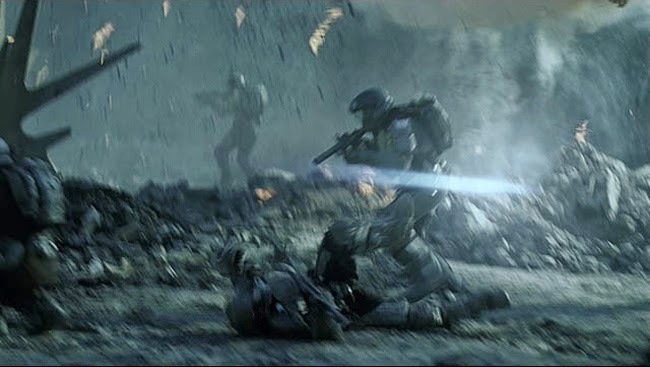 Each team must fight over the control of three tactical objectives on the map, those represent data cores, injured teammates, lost weapons caches, etc. Take and hold these "hardpoints" to earn VP. Squats: Build a squat with 200- (quick), 400- (standard), or 600-point cost limits (epic) using the standard squat construction rules (see “Building a squat”, p. X). Setup: Hardpoint uses the standard set-up procedure for terrain (see “Preparing the battlefield”, p. 42). After placing and defining the terrain, you must place an objective in the middle of the board (Alpha target), then each player must place 2 tactical objectives in thier own deployment zone at 12" (or more) from the table edge and all must be 12" apart of each other. Deployment: After positioning the objectives, you deploy your squat. Hardpoint uses the standard Deployment procedure (see “Deployment”, p. 44). Scoring Victory Points: There are two ways to score victory points. Killing the Team Leader: Each player must select one non-vehicle character from their squat, that is the squat leader. If you manage to kill the squat leader from the enemy squat you score 20 victory points (in a quick match), or 40 victory points (for standard matches), or 60 victory points (for epic games). Controlling objectives: At the end of a round, for each objective that you control you score 15 victory points (in a quick match), or 30 victory points (for standard matches), or 45 victory points (for epic games). You control an objective if there is at least one of your characters, and no enemy characters, within 3" of it. As different objectives vary in shape and size, it is important to agree at the beginning of the game exactly where this distance will be measured from. You can use counters or designed a terrain piece in the battlefield as objective, in that case the control area is measured from the base or hull of the terrain. Ending the game: This mission last a random number of game turns. At the end of game turn 5, a player must roll a dice. On a 1-3 the game ends immediately, on a 4+ a new game turn is played. If this is the case, a player will roll another dice at the end of each turn after the 5th, until 1, 2 or 3 is rolled, in that moment the game ends automatically. Victory Conditions: When the game ends (see ending the game, above) the player with the higher number of victory points wins the battle. In a Hardpoint game, at the end of any phase victory goes to the 1rst player to score victory points equal to point cost limit used in squats construction; for example, 400 points in a 400-point battle. This scenario, the standard, rewards combat effectiveness and clever manoeuvring. Setup: Assault uses the standard set-up procedure for terrain (see “Preparing the battlefield”, p. 42). After placing and defining the terrain, you must place 3 tactical objectives. Each player setup one objective in their own deployment zone at 12" from the table edge and the final objective are placed in the middle of the board (alpha objective). Deployment: After positioning the objectives, you deploy your squat. Assault uses the standard Deployment procedure (see “Deployment”, p. 44). Destroying enemy Characters: You score victory points equal to the cost of each destroyed enemy characters. If the character has any items assigned to it when it is destroyed, you score victory points equal to the cost of those items as well. Controlling objectives: At the end of each round, if any of your characters control the objective set in your deployment zone, you score 10 (quick), or 15 (standard), or 20 (epic) victory points. If Any of your characters control the objective in the middle of the board you score 20 (quick), or 40 (standard), or 60 (epic) additional victory points. And finally if you control the objective set in your opponent deployment zone you score 30 (quick), or 60 (standard), or 90 (epic) additional victory points. You control an objective if there is at least one of your characters, and no enemy characters, within 3" of it. As different objectives vary in shape and size, it is important to agree at the beginning of the game exactly where this distance will be measured from. The number of victory points granted by this objective depend of the size of the game (quick/ standard/ epic). Victory Conditions: Victory goes to the 1rst player to score victory points equal to point cost limit used in squats construction; for example, 400 points in a 400-point battle. This scenario represents a quick clash between small groups of skirmishers. Setup: Slayer uses the standard set-up procedure for terrain (see “Preparing the battlefield”, p. 42). After placing and defining the terrain, you must place 1 tactical objective in the middle of the board. Deployment: After positioning the objectives, you deploy your squat. Slayer uses the standard Deployment procedure (see “Deployment”, p. 44). Priority target: At the beginning of the game, each player must select one enemy character between the 3 enemy character with higher point cost in the enemy squat. From now on that is the priority target and destroying it will reward you with his point cost in VP plus 25 VP in a 200-point battle, 50 VP in a 400-point battle, and 80 VP in a 600-point battle. Controlling objectives: At the end of each round, if any of your characters control the objective set in the middle of the board you score 20 (quick), or 40 (standard), or 60 (epic) additional victory points.